A car called a Suzuki Splash drove into a pool. Is that what’s called “irony” or just a live-action pun? Surely we’ve all fantasized about crashing a car into a pool, but I guess if you’re going through with it you couldn’t have a better choice of vehicle. The thing is even pool-water colored! I’m amazed it managed to stay out of pools for as long as it did. 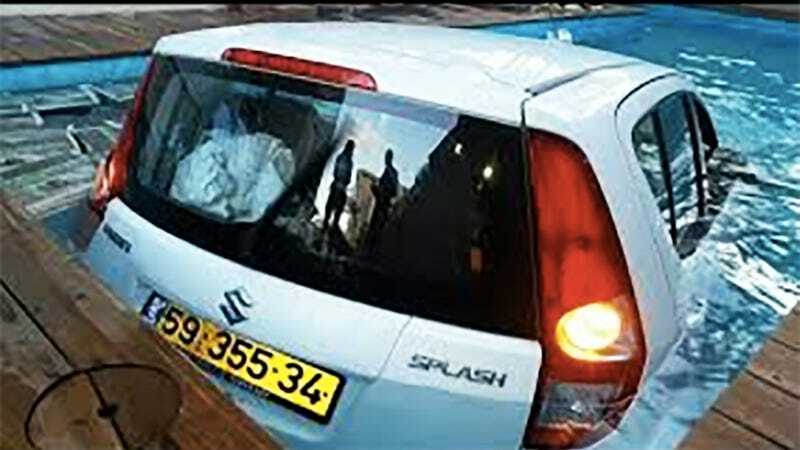 These images came to us from a reader in Israel, who simply said, it “made a splash.” Looks like somebody, presumably the driver, received medical treatment as a result of the incident. At least the rescue would have been easier than if the car had gone into a murky lake or the ocean. As for how the Splash actually ended up in the pool, besides succumbing to an instinctual calling, I can only imagine that somebody mixed up the gas and brake. Or put the car in drive instead of reverse.